ATEM Television Studio HD is the first live production switcher designed for both broadcasters and AV professionals. It includes 4 SDI and 4 HDMI inputs so you can connect up to 8 sources, and it supports all formats up to 1080p60. Packed with high end broadcast features, ATEM Television Studio HD has re-sync on all inputs so you always get clean switching whether you’re using professional or consumer cameras. Plus, you get multi view output so you can see all of your sources, preview and program on a single screen, aux out, built in talkback, 2 still stores, an audio mixer, camera control unit and more! ATEM Television Studio HD is perfect for live production, episodic television, web shows, AV or even live coverage of video gaming competitions. Simply plug in your cameras, game consoles or computers and start switching live. Blackmagic Design's ATEM Television Studio HD is perfect for broadcasters and A/V professionals - a compact yet potent and easy-to-operate solution. On the back of the frame four of both HDMI and SDI inputs are available and each set of inputs support SD and HD signals. This relatively small unit slots nicely on to a standard equipment rack with the separately available Teranex Mini Rack Shelf, enabling you to take it on location for streaming video, or to be installed semi-permanently into a studio for recording or broadcasting. The front panel features the most crucial controls and allows simple adjustments. 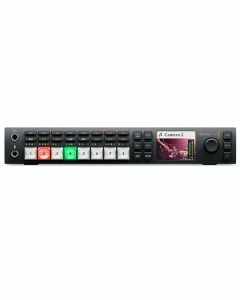 More advanced controls and settings like upstream and downstream keyers, graphics, media, and precise mixing for the 10 channels of available audio can be accessed through the USB interface or with an ATEM control surface. BNC and HDMI connections for input and output can be found toward the rear. To align with your equipment setup, MultiView can be transmitted over SDI or HDMI. An AUX output also allows the user to send video to an external display – ideal for live events with a projection setup. Four of the SDI outputs have embedded talkback audio for studio setups. Blackmagic Design Studio Cameras can also be controlled from the switcher, permitting greater levels of operational consistency. The Blackmagic Design ATEM Television Studio HD is a professional broadcast SDI switcher with a veritable bounty of HDMI connections. The above mentioned four 3G-SDI and four HDMI inputs make it possible to connect up to eight cameras, game consoles, computers or other sources and work in all SD and HD formats up to 1080p60. That means you can start with affordable HDMI consumer cameras or go straight in with professional SDI broadcast cameras. Reference input, analogue audio in, RS-422 PTZ control, and Ethernet for connecting hardware or software control panels are also provided. Unlike other switchers, all video inputs feature automatic frame re-synchronizers, eliminating the need for expensive genlock cameras. Plug in any video source – it will work. ATEM Television Studio HD also features built in talkback to take advantage of the rarely used SDI channels 15 and 16 and send talkback audio to and from the camera. A headset connection also sits on the front panel for talking to, and listening from, cameras that support SDI talkback. The talkback from the camera is embedded in the SDI video feed from the camera to the switcher. Connecting the talkback SDI outputs of the switcher back to the camera will mean that the director’s talkback audio will be sent to the cameras along with tally and camera control. The four SDI outputs also send talkback to cameras with mix minus, so you can send program audio back to an interviewee enabling them to hear everything except themselves, avoiding the distraction of a delayed audio echo. Ultra HD Format Support: None. Media Pool Clip Capacity: None. Media Player Clip Length in 720 HD: None. Media Player Clip Length in 1080 HD: None. Media Player Clip Length in Ultra HD: None. Media Pool Video File Format: None. Media Pool Audio File Format: None.